Hiking and exploring are a huge, huge part of how I regenerate when I'm "spent". Fresh air, exercise and immersion in nature -- that's where I go to recharge and I usually go home inspired with a new idea for my artwork. What does a mountain trail have to do with oil painting and my art studio? Everything. So if you're visiting Asheville, here are a couple more hikes I am always recommending: Graveyard Fields and Skinny Dip Falls. Both are a wonderful way to spend the day and are both easy hikes (no excuses not to enjoy!). Graveyard Fields is a super popular hiking destination on the Blue Ridge Parkway (Milepost 418.8). The Yellowstone Prong is the water source for two waterfalls in a mile-high valley filled with wildflowers and surrounded by Blue Ridge mountains with 6,000-foot peaks. The area got it's name years ago from the tree stumps and surrounding trees that looked like grave stones in a graveyard setting. The trees were toppled by a huge wind several hundred years ago. Then in 1925, an intense fire burned the recently logged area, and the forest has been slow in recovering since. This provides a stark contrast to most hiking in the Asheville area. Their beautiful hiking trail (Graveyard Fields Loop) is about four miles. Start from the overlook on the Blue Ridge Parkway. There is a map on the sign at the parking area. Take the trail at the lower end (right side looking away from Parkway) of the parking area. This descends down a paved path through a thick patch of rhododendron, down some steps and to a bridge. Cross the bridge, turn right along the trail until you come to the first trail intersection to the right, and descend a long flight of steps to viewing platform for Lower (or Second) Falls. You can get a closer look from the boulders at the base of the falls. You can even slide down a portion of the waterfall! This beautiful waterfall is just short hike from the parking area. It's a popular swimming hole to get splash around in the cool mountain water and slide down part of the waterfall. The rocks are slick and there are no lifeguards on duty. So be careful! Skinny Dip Falls are beautiful. Really one of our favorites. It's a refreshing swimming hole and soaking spot on a hot summer day with clear, cold water. And it's a beautiful waterfall setting to enjoy any time of the year without getting wet with multiple cascades and pools. Located on the Blue Ridge Parkway (at Milepost 417 at Looking Glass Rock overlook), it's easy to find at the end of a 1/2 mile hiking trail from the Parkway overlook. Sorry, Skinny Dip Falls is not clothing-optional. And In addition to a nice "jump off rock" into a deep pool (about six feet deep), there are several places to wade or have a seat in the cool mountain water. Recharging one's batteries (so to speak) is essential to me as an artist. Getting out and hiking is the best way to "reboot" my system. Get some fresh air and miles under my belt and creativity just flows naturally. Maybe everyone is that way but I've always had to get out and breathe, you know? 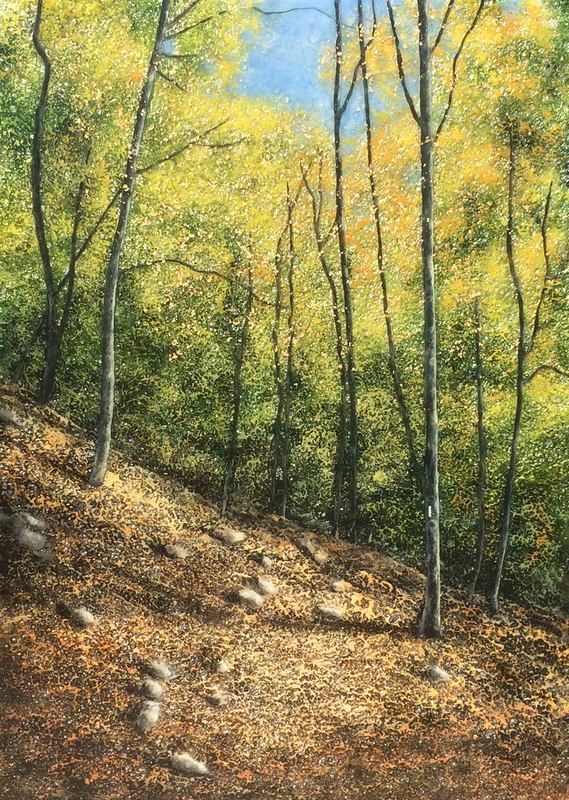 And because with an open painting studio in Asheville's River Arts District, I am sometimes the unofficial town greeter, and am asked about fun things to do (including hiking). So it seemed like a good idea to share some of my favorite hiking trails around here. This three-mile hike to two awesome waterfalls is the most popular waterfall hike near Asheville and one of my favorites. The moderate hike has a few hills but is perfect for about all fitness levels and families. Since it's so popular, weekends especially in the summer and fall bring big crowds. Triple Falls has three cascades with a total 120-foot drop. Just past an overlook, a trail forks off to the left and heads down to land on a large rock area below the top two falls and atop the third. It's a great place to relax or have a picnic, while you enjoy the views up and down the waterfall. From Triple Falls, continue about 1/2 mile on the High Falls Trail to the largest waterfall, a 150-foot cascade down an inclined plane of granite. En route, you'll see the River Bend Trail to the left. Take this detour to reach the base of High Falls (includes rock hopping along the river). A must hike along the Blue Ridge Parkway (milepost 420.2, about 26 miles from the Asheville exit on the Parkway) is the Black Balsam Knob area that includes some of the most spectacular mountain balds in the Southern Appalachians, including Black Balsam Knob (or Black Balsam Bald), Sam Knob, and Tennent Mountain. These treeless mountaintops in the Pisgah National Forest draw people from all over to soak in the sweeping views with an alpine-like feel. Almost entirely devoid of trees above 6,000 feet elevation, the summits are more reminiscent of New England than North Carolina. This 4,600-foot mountain was cleared and used as pasture in the 1800s. 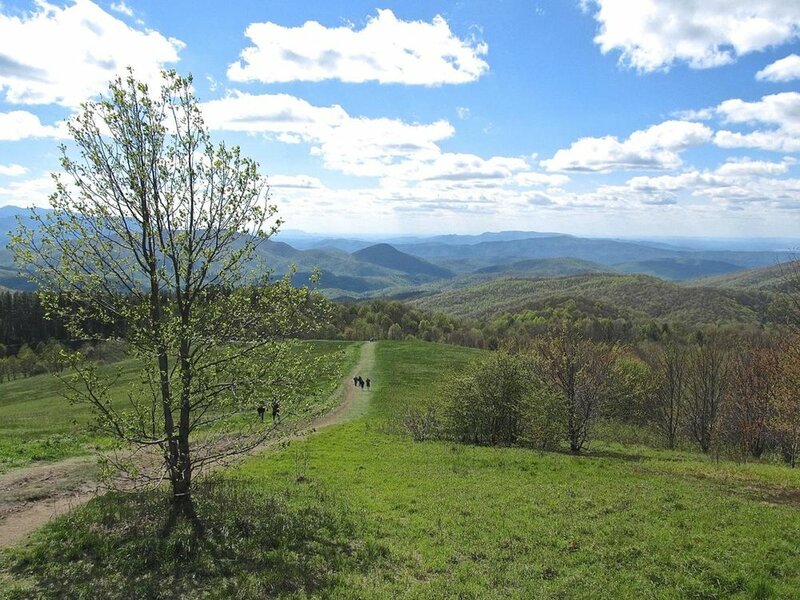 Today, it's a 350-acre tract of open land on a high knob with 360-degree views. On a clear day, you can see from Mt. Mitchell on the east to the Great Smoky Mountains on the south. What a picnic spot! And great for star gazing and enjoying wildflowers. The summit is a short walk from the parking lot. 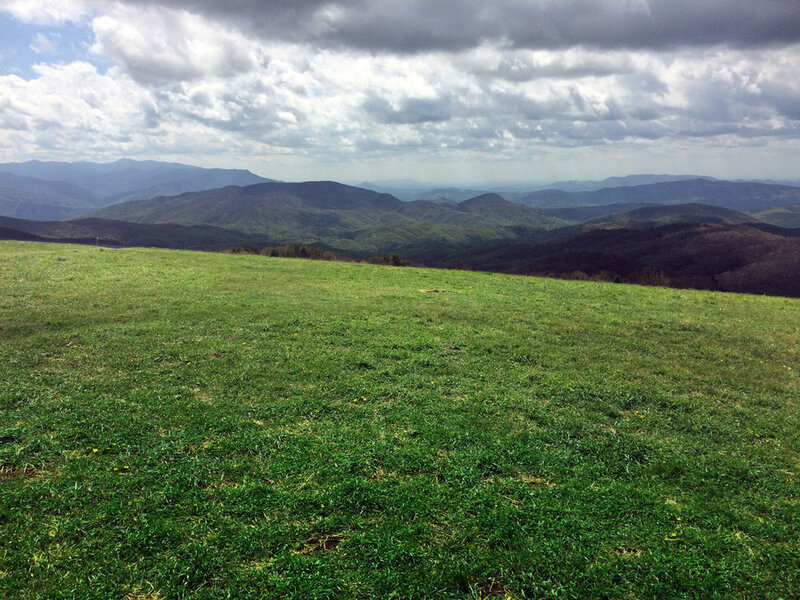 Max Patch is part of the Pisgah National Forest. The Great Smoky Mountains, only 20 miles away, dominate the southwest horizon. To the west the terrain drops more than 3600 feet into the flatlands of eastern Tennessee. To the west 50 miles, rises the dark ridgeline of the Black Mountains. Endless ridges and peaks fill every vista.